Primeview USA has made three new additions to its commercial grade UHD 4K LED LCD line of large format LCD displays with HDBASET embedded. This line now offers 55”, 65” and 84” display solutions with ultra-high 4K resolution. For most commercial applications, the flat screens are often the focus of attention and thereby the largest investment for most end-users. With mass adoption in recent years, commercial grade LCDs have increased in size, while finally becoming more affordable. Since the beginning of 2013, UHD 4K resolution LCD demand has been growing across every vertical. 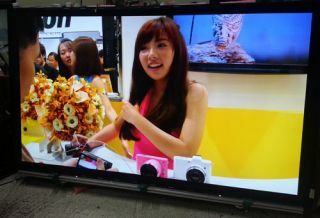 In the commercial space, Primeview launched its 84-inch UHD LED LCD with HDBASET embedded nearly 6 months before InfoComm 2013. “While many applications may not have 4K content today, these units come standard with an internal processor that turns FHD input to 2K resolution. Also, much like our previous 84” 4K LED LCD releases, the new 65” & 55” 4K units provide options for smaller rooms that are looking for a more dynamic solution,” said Chanan Averbuch, Director of Business Development at Primeview USA.